Only 3.46 Crore TAX PAYERS In India.Total Population Over 125 Crore. 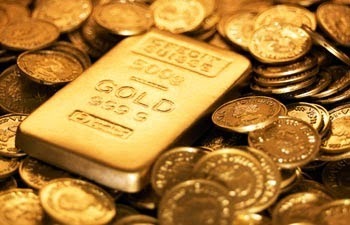 India's Gold imports were up by 65.13 percent to USD 3.12 billion, exports up 10.22 percent to USD 26.4 billion in June. The country’s exports grew by 10.22 percent to USD 26.4 billion in June while imports stood at USD 38.24 billion, up by 8.33 percent, leaving a trade deficit of USD 11.76 billion, according to the Ministry of Commerce and Industry's data. Country's exports stood at USD 24 billion in June last year while imports were at USD 35.3 billion, the data showed. Exports in May rose by 12.4 percent to USD 28 billion over the same month a year ago, while imports fell by 11.4 percent to USD 39.23 billion. In the April-June period, exports grew by 9.31 percent to USD 80.11 billion. Imports, however, dipped by 6.92 percent to USD 113.19 billion during the first three months of this financial year. Trade deficit during the period stood at USD 33.08 billion. Oil imports increased by 10.9 percent in June to USD 13.34 billion. Non-oil imports during the month under review were up by 7 percent to USD 24.9 billion. Country's gold imports were up by 65.13 percent to USD 3.12 billion in June this year from USD 1.88 billion in the same month last year. Union Railway Minister D.V. 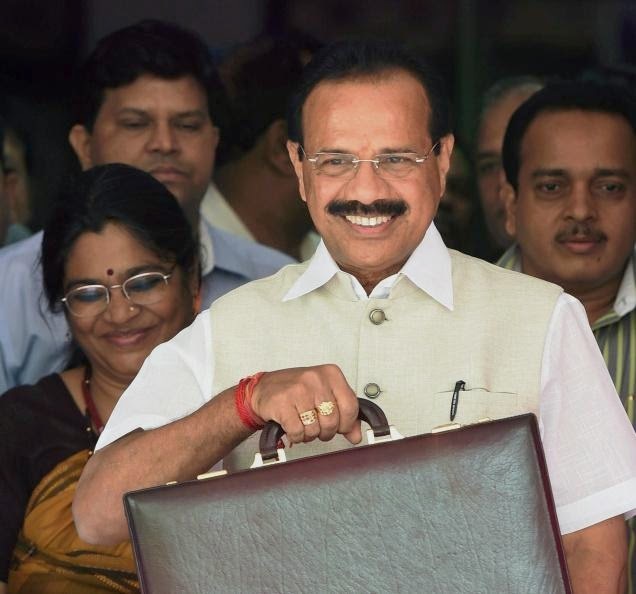 Sadananda Gowda presented his maiden Railway Budget in Parliament on Tuesday. Here are the highlights of this Budget. * Expenditure in 2014-15 pegged at Rs. 149,176 crore. P-Notes from Mauritius will be TAXED in India to Stop Black Money Circulation ! Can See this Announcement in coming Budget ! Watch : Wednesday or Thursday … Nifty Will Hit TOP and Slide will start ! * RETAIL PARTICIPATION: Tax sops to encourage retail investors’ participation in equityThe finance ministry is set to push through major reforms in equity and debt markets to be implemented in the next three months. According to the plan, the foreign borrowing norms are to be liberalised and the capital controls imposed by the Reserve Bank of India last year rolled back. The ministry is also considering replacing short-term capital gains tax with a higher securities transaction tax (STT). While tax incentives are being considered for retail investors and permanent establishments managing global funds in India, measures are in the offing to deepen corporate bond markets, strengthen retail participation in equities, comprehensively revamp depository receipts and join Euroclear, the world’s largest securities settlement system. To sell the Indian reform story to foreign investors, Finance Minister Arun Jaitley is planning to go to London, Tokyo, Hong Kong, Singapore and New York for road shows. Budget measures might include abolishing short-term capital gains tax and, instead, levying a higher securities transaction tax (as suggested by the Parthasarathi Shome committee), exempting global income of India-based permanent establishments from tax, and offering tax sops to encourage retail investors’ participation in equity markets. The finance ministry wants to take measures to boost investments by domestic players, especially the retail ones, as the market rally in recent times has mainly been driven by inflows from foreign investors. 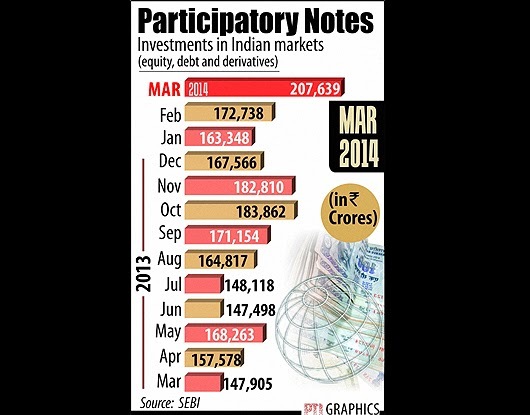 “Participation of retail investors is a big concern. We have to push this in a big way,” another official said. The ministry will also try to widen the scope of both American and global depository receipts (DRs). Currently, only listed companies are allowed to sell DRs (that too only against underlying equity shares). The M S Sahoo committee had proposed DRs for debt and unlisted companies as well. 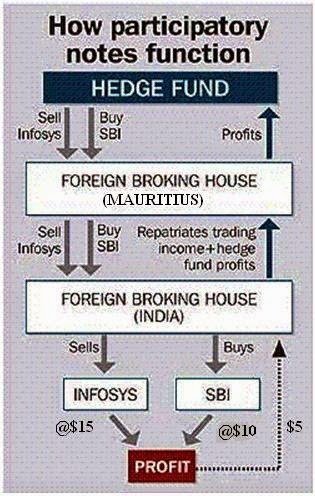 These would give easy access to foreign investors who don’t wish to invest directly in Indian companies. The finance ministry also wants to relax the external commercial borrowing (ECB) norms and enable companies to fully hedge against foreign currencies. “We want to let borrowers decide how much they want to raise. If you hedge it, the cost of borrowing goes up. So, naturally, they will be cautious,” said the second official quoted earlier. Experts said ECBs should, in fact, be liberalised generally, with control only for certain sectors. “Refinancing of ECBs should be allowed on a wholesale basis. They should ease end-use of ECBs because international markets provide cheaper funds. Its use should be expanded significantly, while there should be control for certain sectors,” said Abizer Diwanji, partner and national leader (financial services), EY. In a step towards internationalising debt, the government is also planning to join Brussels-based Euroclear bank. This will facilitate cross-border settlement of locally-issued government bonds. Officials said this would bring down borrowing cost for Indian companies. The ministry is getting legal opinion on whether this would require amendment to the Sebi Act. It is awaiting a formal view from RBI on the issue. The government is also trying to liberalise the rupee-denominated corporate bond market. So far, its efforts to deepen this have yielded little result. “If banks are ready to lend at cheaper rates, who would go for corporate bonds? Unlike the US, our economy is dependent on bank debt,” the official explained. As some of you might recall, Ronald Reagan's now-famous 1984 presidential campaign, "Morning in America," renewed many Americans' confidence in this country's financial future. Likewise, the May 16 election of Narendra Modi--whose campaign slogan, "Good times ahead," taps into the same sense of optimism--couldn't come at a better time for India and the surrounding region. Sworn in on Tuesday, Modi's pro-business, small-government policies have already prompted many citizens of the world to liken him to such transformative leaders as Reagan and Margaret Thatcher. Because he has vowed to widen India's doors to foreign investment, rehabilitate its crumbling--or, in many regions, nonexistent--infrastructure, deregulate the retail industry and loosen the red tape that has halted domestic coal production, investor confidence in the South Asian country has surged like never before. For the past six months, foreign investors have bought up more than $16 billion in Indian stocks and bonds in anticipation of Modi's win and hold approximately 22 percent of Mumbai-listed equities, valued at nearly $280 billion. 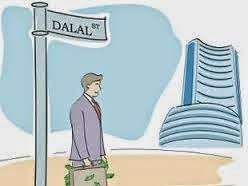 Since the election, the Indian markets have been bullish, with the rupee crossing 59 levels against the dollar. 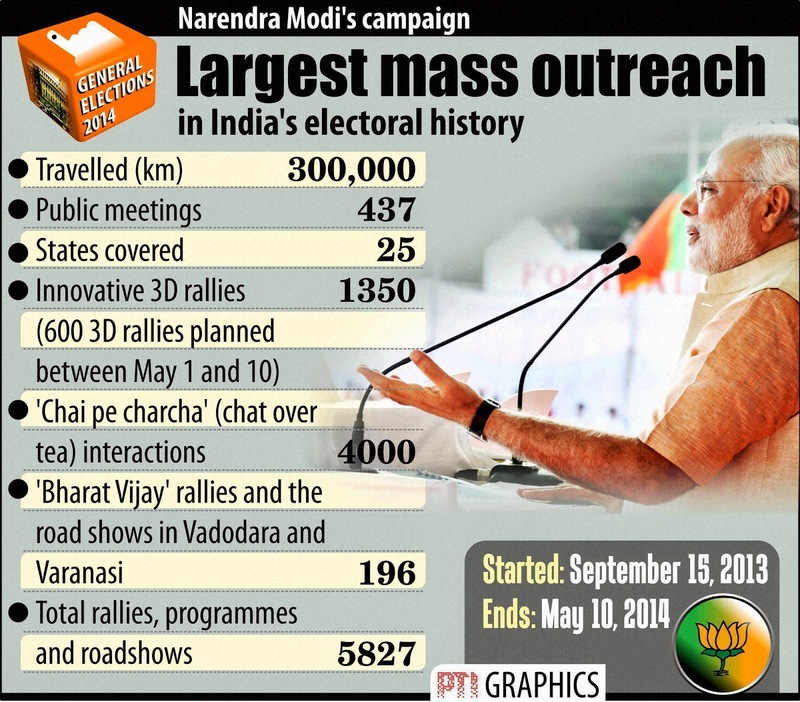 These activities have made the world's largest democracy the top performer this year among the four BRIC economies. "We want more strength for the wellbeing of the country," Modi said after declaring victory. "I see a glorious and prosperous India." Modi has a proven track record of turning economies around. As head of the state of Gujarat, a position he held prior to being elected prime minister, he oversaw annual economic growth of 10 percent. He is also credited for bringing electricity to all 60.4 million Gujarat residents--a first for India. One of his loftier goals is to do the same for all 1.2 billion Indians using clean power generation such as wind and solar. Currently, 400 million citizens--more than the combined populations of the U.S. and Canada--are without power. The plan is that by 2019, every home will be able to run at least two light bulbs, a cooker and a television. Such a colossal undertaking as bringing power to every home will require the import and production of untold amounts of metals such as copper and steel, not to mention the construction and rehabilitation of the nation's poor infrastructure, which is decades behind China's. According to Ajay Piramal, Chairman of the Piramal Group, one of the roads to India's prosperity is "infrastructure development. Reviving infrastructure projects by streamlining approval and decision-making processes will be critical. By 2019, the structural growth rate of India should be at 8 percent or higher." Under the new prime minister's watch, the growth of industrials and materials is very promising. India is already the fourth-largest steelmaker in the world, having produced 7.25 million tonnesin March alone. 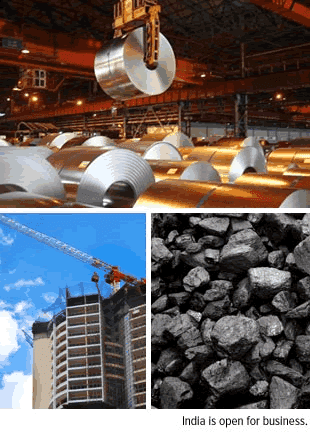 But with the implementation of new infrastructure and energy projects, steel production has the potential to explode. The same can be said of coal. 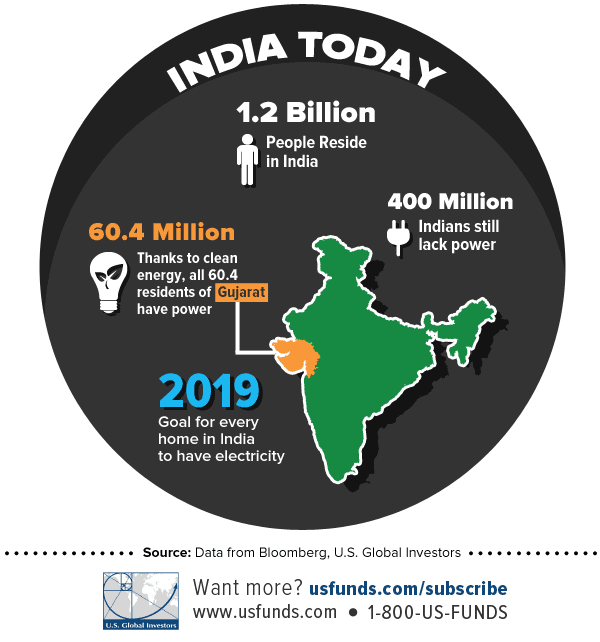 Even though India, the world's second-most populous country, is rich in coal, mining has historically been stymied as a result of tortuous bureaucracy and stateism. To facilitate foreign investment in the resource and boost product output, Modi is considering breaking up Coal India Ltd., India's state-controlled mining company. With more jobs up for grabs, more Indians will be able to afford the sort of lifestyle and consumption habits that many Americans enjoy. As I've previously discussed, gold is a prime gift to give and receive in India during religious holidays and celebrations. A robust working class will ensure that gold continues its trend as a desired and accessible commodity. It's too early to tell if morning has indeed arrived in India. To be sure, the nation faces many challenges that block its path to prosperity, including debilitating bureaucracy, an inefficient agricultural sector, low literacy rate and widespread poverty. But as I often say, government policy is a precursor to change, and with Modi at the helm, "good times ahead" sounds like more than an empty promise. Provided his administration can make good on his many ambitious plans, investment in the energy, industrials, materials and utilities sectors could conceivably see fair returns. Didn't follow tonight's historic election in India (which caused the local market to surge as much as 6.2% at one time hitting an all time high) which has left the nation with a "general feeling of euphoria"? Then this full recap of what just happened, courtesy of Bloomberg, is for you. Congress party President Sonia Gandhi concedes defeat after coalition led by Narendra Modi’s opposition Bharatiya Janata Party sweeps Indian election. BJP bloc leads in 335 seats and Congress-led bloc in 59, according to NDTV tally of count as of 4:39 p.m. in Mumbai. In “extremely positive” scenario: 10% rupee appreciation in 12 mo. Is India’s E-Voting a Turn for the Better? Given the surge in India's stock market, echoing the reflexive pro-business exuberance of last year's Japanese stock market, the similarities between India's newly-elected PM Narendra Modi and Japan's Shinzo Abe are coming thick and fast... some good (pro-business), some bad (potential dislike of the US) and some potentially ugly (strong nationalist tendencies). After a prolonged period of political drift and paralysis, India’s new government will be led by a man known for his decisiveness. Just as Japanese Prime Minister Shinzo Abe’s return to power in late 2012, after six years of political instability, reflected Japan’s determination to reinvent itself as a more competitive and confident country, Narendra Modi’s election victory reflects Indians’ desire for a dynamic, assertive leader to help revitalize their country’s economy and security. Like Abe, Modi is expected to focus on reviving India’s economic fortunes while simultaneously bolstering its defenses and strengthening its strategic partnerships with likeminded states, thereby promoting regional stability and blocking the rise of a Sino-centric Asia. The charismatic Modi – a darling of business leaders at home and abroad – has promised to restore rapid economic growth, saying there should be “no red tape, only red carpet” for investors. The 63-year-old Modi mirrors Abe’s soft nationalism, market-oriented economics, and new Asianism, seeking close ties with Asian democracies to create a web of interlocking strategic partnerships. In a country where the gap between the average age of political leaders and citizens is one of the world’s widest, Modi will be the first prime minister born after India gained independence in 1947. This constitutes another parallel with Abe, who is Japan’s first prime minister born after World War II. There is, however, an important difference in terms of the two leaders’ upbringing: While Modi rose from humble beginnings to lead the world’s largest democracy, Abe – the grandson and grandnephew of two former Japanese prime ministers and the son of a former foreign minister – boasts a distinguished political lineage. 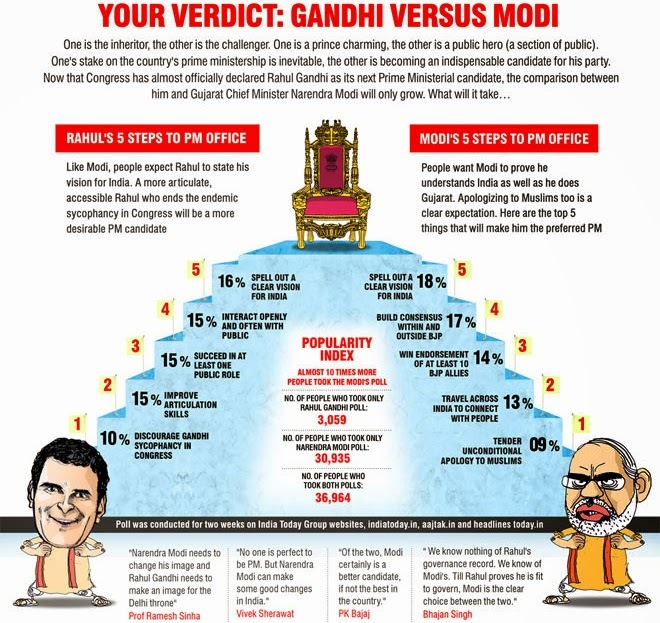 In fact, Modi rode to victory by crushing the dynastic aspirations of Rahul Gandhi, whose failure to articulate clear views or demonstrate leadership ran counter to the Indian electorate’s yearning for an era of decisive government. Modi, like Abe, faces major foreign-policy challenges. India is home to more than one-sixth of the world’s population, yet it punches far below its weight. A 2013 essay in the journal Foreign Affairs, titled “India’s Feeble Foreign Policy,” focused on how the country is resisting its own rise, as if the political miasma in New Delhi had turned the country into its own worst enemy. Many Indians want Modi to give a new direction to foreign relations at a time when the gap between India and China in terms of international stature has grown significantly.India’s influence in its own backyard – including Nepal, Sri Lanka, and the Maldives – has shrunk. Indeed, Bhutan remains India’s sole pocket of strategic clout in South Asia. India also confronts the strengthening nexus between its two nuclear-armed regional adversaries, China and Pakistan, both of which have staked claims to substantial swaths of Indian territory and continue to collaborate on weapons of mass destruction. In dealing with these countries, Modi will face the same dilemma that has haunted previous Indian governments: the Chinese and Pakistani foreign ministries are weak actors. The Communist Party and the military shape Chinese foreign policy, while Pakistan relies on its army and intelligence services, which still use terror groups as proxies. The Modi government is unlikely to let another Mumbai-style terrorist attack staged from Pakistan go unpunished, employing at least non-military retaliatory options. Restoring momentum to the relationship with the United States – damaged recently by grating diplomatic tensions and trade disputes – is another pressing challenge. But Modi’s commitment to pro-market economic policies and defense modernization is likely to yield new opportunities for US businesses and lift the bilateral relationship to a new level of engagement. America’s strategic interests will be advanced by likely new defense cooperation and trade that boosts U.S. arms sales and creates avenues for joint military coordination.The U.S. already conducts more military exercises with India than with any other country. Modi is the sort of leader who can help put U.S.-India ties back on track and boost cooperation. Yet there is a risk that his relations with the U.S., at least initially, could be more businesslike than warm, owing to an American slight that is hard for him to forget. In 2005, the US government revoked his visa over unproven allegations that he connived in Hindu-Muslim riots in 2002, when he was Chief Minister of Gujarat. Even after India’s Supreme Court found no evidence to link Modi to the violence, the US continued to ostracize him, reaching out to him only on the eve of the recent election. With the US having expressed no regret for its revocation of his visa, Modi is unlikely to go out of his way to befriend the U.S. by seeking a White House visit. Instead, he is expected to wait for US officials to come calling. By contrast, Modi is likely to remember states, such as Japan and Israel, that courted him even as the U.S .targeted him. Modi’s 2007 and 2012 visits to Japan opened new avenues for Japanese investment in business-friendly Gujarat. Moreover, Modi has forged a special relationship with Japan and built personal rapport with Abe. When Abe returned to power, Modi congratulated him with a telephone call. A deeper Japan-India entente under Abe and Modi could potentially reshape the Asian strategic landscape. It is no surprise that Abe rooted for a Modi victory. The BJP’s massive margin of victory might yield a new type of Indian politics, effectively reducing parliamentary barriers to passing new legislation. With 274 seats, the new prime minister and his party will be able to maneuver whatever measures they see fit through parliament without the hassle of having to deal with often-fickle coalition partners or a recalcitrant opposition. It remains to be seen how the BJP will manage its coalition partners within the NDA. The smaller parties within the NDA, including the Shiv Sena and the Telugu Desam Party, might find their influence wane within the coalition given the BJP’s majority. Additionally, the outcome in the next Rajya Sabha (the upper house of India’s bicameral legislature) elections will likely moderate the BJP’s ability to wield power unchecked — the party is expected to be the minority in the Rajya Sabha. 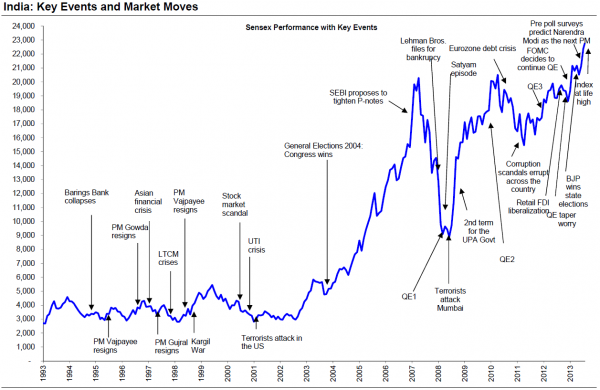 Even before the NDA had conclusively reached a majority in parliament, investors took the took India’s SENSEX Index to an all-time high, bringing the Indian Rupee to a 10-month high against the U.S. dollar as well. Modi and the BJP are widely perceived to be able to succeed economically where the Indian National Congress failed. Although the BJP will not immediately reverse several of the Congress’ populist schemes that have driven the Indian government into fiscal unease, it is expected to address broader economic issues such as inflation and development. Part of Narendra Modi’s popular appeal is also rooted in his image as a politician free of the taint of corruption. During the UPA’s 10 years in power, several high-profile scams exposed corruption at the highest levels of Indian government, jading voters and driving them to the BJP. Among Modi’s critics, concerns will persist about the future of India’s secularism and the fate of India’s Muslim minority. Modi’s record as the chief minister of Gujarat has come under incessant scrutiny by observers both in India and abroad. Some allege that his complicity in the deadly 2002 Godhra riots that resulted in the deaths of hundreds of Muslims render him unfit to lead a country as pluralistic as India. Despite widespread concern, both in India and abroad, it appears that Indian voters have chosen to elect Modi on the merits of his economic vision rather than whatever his views towards India’s Muslims might be. The BJP as a whole is a Hindu nationalist party, influenced heavily by the often-militant Hindu organization, the Rashtriya Swayamsevak Sangh (RSS). 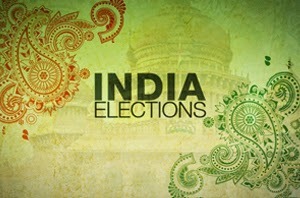 Overall, these elections demonstrate that Indian democracy is functional where it counts: holding a government accountable for poor political, economic, and social outcomes. It remains to be seen if the BJP will deliver what India’s voters want, but for now, the party seems to have won the broadest mandate of any single party in Indian politics in decades. The two key variables that will be critical in reviving India’s growth trend are: (a) improvement in the external environment and (b) a pickup in the pace of structural reforms. Our global economics team expects that global growth will improve further to 3.7% in 2015, moving closer to the last 30 years’ average, giving us the confidence that the external environment will be supportive of India’s growth recovery. Policy reforms at home will be even more critical. Over the past five years, the government’s policy was focused more on redistribution and less on boosting productive income growth. Moreover, bureaucratic hurdles and corruption-related investigations have exacerbated the challenges of weak demand and low corporate confidence. This has held back the much needed capex cycle and has been a drag on economic growth. Overhauling bureaucratic processes and enacting reforms to lift sustainable growth is imperative. The macro stability risks of higher inflation, a wide current account deficit and asset quality issues in the banking system associated with such a policy approach has forced a recognition among policy makers of the need to pay greater attention to reviving the productive dynamic. Higher economic growth rates are needed to generate the productive employment opportunities for India’s large and growing working age population. Moreover, India’s literate and well-connected middle class is now reaching critical mass. President Barack Obama tonight congratulated Narendra Modi for his electoral victory during a telephone call and invited him to visit the US at a mutually agreeable time to further strengthen the bilateral ties. "The President invited Narendra Modi to visit Washington at a mutually agreeable time to further strengthen our bilateral relationship," the White House said following the maiden telephonic conversation between the two leaders. The phone call was stated to be brief. Modi, during his US visit would be eligible for an A-1 visa, State Department Spokesperson Jen Psaki said. "The Prime Minister of India will be welcomed to the United States. As Head of Government, Modi would be eligible for an A-1 visa," she said. We assume the US needs all the friends it can right now. India's Bharatiya Janata Party accused its main political rival, Congress, of driving away investors during its decade in power and promised more business-friendly policies if it is elected in national polls that started Monday. 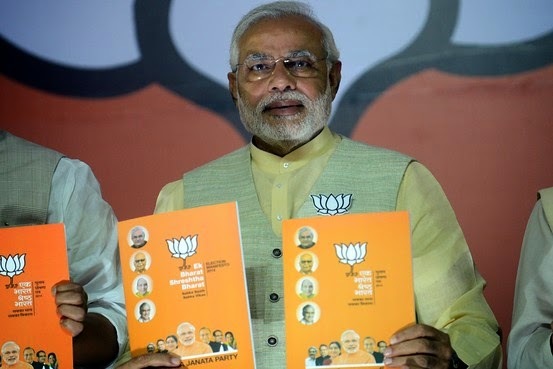 In its election manifesto, released Monday morning in New Delhi, the BJP said: "We will bring back credibility and trust in government, resowing confidence in the India story domestically as well as internationally." The Hindu nationalist party also attacked the incumbent Congress party-led government for using "tax terrorism" against companies. 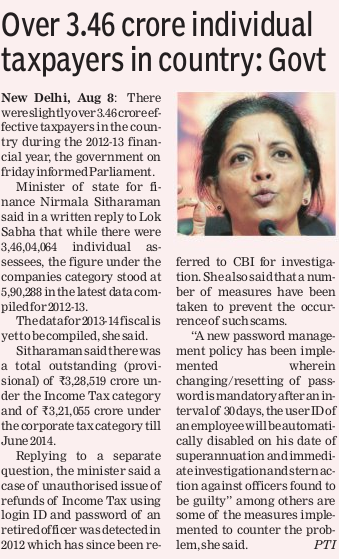 The BJP said it would provide a nonadversarial administration and simplify the country's complicated tax laws. The BJP, and its candidate to be prime minister, Narendra Modi, appear to be in the lead as voters began casting their ballots in an election that is to last five weeks. A recent poll by the Pew Research Center found that more than 60% of Indians favor a BJP-led government. A string of corruption allegations, rising inflation, slow policy-making and huge tax notices to several foreign companies have hurt investor confidence in India, dragging down economic growth to its weakest in several years. Indian stocks have rallied on investors' belief that the BJP is likely to win and run a government more attuned to business interests. Election results are to be announced on May 16. Congress Last 5 Years, Choose Your PM Gandhi Vs Modi, Congress Or BJP.